DPI, Guyana, Wednesday, September 12, 2018 - President David Granger today said a Ministry of Petroleum is likely to come on stream in 2020 when oil production starts. Speaking on the sidelines of the swearing-in of the Police Complaints Authority, the President said at this stage the Government does not want to establish a new ministry, owing to the fact that the Department of Energy is now being operationalised. “In terms of its organisation, administration, legislation, it has a lot of work to do. So, it probably will not be before 2020 that a full-blown ministry could be established. I think it would be a rush job, it would be hasty,” the President told media operatives. The President said the Department of Energy is currently assembling a team of international experts. He believes that a two-year period is adequate before establishing an effective and efficient ministry to manage the petroleum sector. 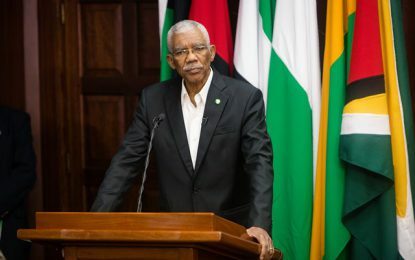 President Granger at his August 31 press conference had announced his administration’s plan to have the new ministry established to manage the sector. The Head of State said the Department of Energy is an interim measure since the small unit within the Ministry of Natural Resources did not have the capacity to bear the burden of a world-class petroleum industry. The Department was established on August 1 and is headed by Dr. Mark Bynoe, an Environment and Resource Economist.